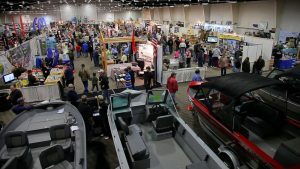 For outdoor men, women, and children from throughout the region, the HAPO Center (formerly the TRAC) will be filled with the latest in outdoor equipment, a trophy antler collection from the northwest, kid’s fishing pond, free air rifle range, free hourly hunting and fishing seminars, and more! This year’s show will include more booths and exhibits than ever, with the new look of the recently renovated Arena. Back by popular demand will be the Outdoor Cooking Camp hosted by Harrod Outdoors. 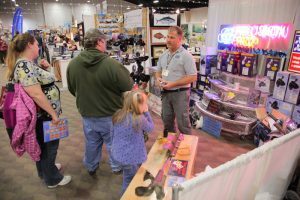 Exhibitors include retail merchants, factory reps, outdoor clubs and organizations, taxidermists, wildlife art, fishing boats, and fishing and hunting guides who will be available to help you plan your vacations. Door prizes will be given away hourly and the first 150-200 people through the door each day will also receive a bonus prize. One time daily admission gets you in all three days for one low price! 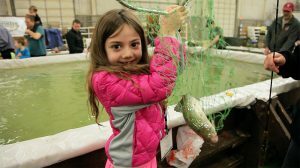 Kids can fish for trout at this well-stocked fishpond. All profits benefit the Richland Rod & Gun Club. Kids can shoot targets for FREE! Hosted by Richland Rod & Gun Club. A fun scavenger hunt for kids of all ages! Complete it and receive a prize! Kids can learn how to shoot a bow. Learn how to tie a fly, and take home your creation!